Designed by David Barnes & Arvin Van Zante. Published by BoardCraft. Kickstarting until August 25th. Preview based on a prototype version of the game using non-final rules. Board games, miniatures games, and 3D-printing have long been believe to have a bright future together. A bright future that nobody has yet capitalized on. We await this bright future no more, or something, well, okay, this rather cool kickstarter project wants to take the first steps. 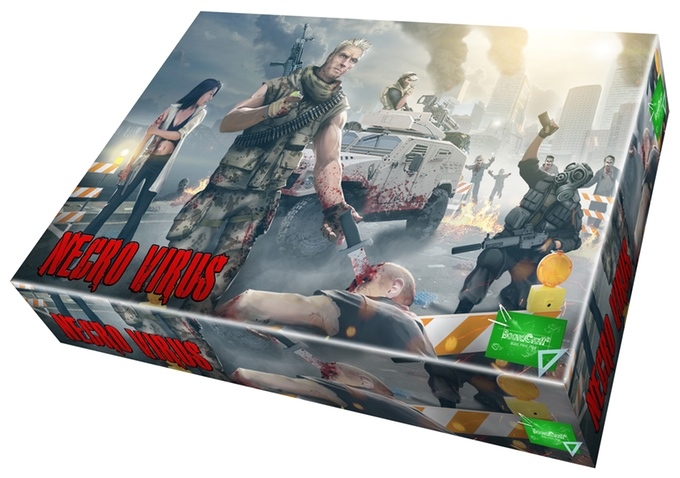 NecroVirus looks like pretty standard Zombie Apocalypse game fare. In some ways, it is. It has a large element of random chance, survival, sneaking, gathering supplies, and other such things. It's backed up by the huge pieces of 3D-printed terrain it takes place on, modelling a city center with buildings, roads, crashed cars, and other post-apocalyptic ephemera. That terrain sits on top of the game's secret: It's powered by the developers' proprietary 2D or 3D printed modular system called BoardCrafter. Using interlocking terrain boards, it's all modular. Each game the city's layout is different, much like any given miniatures wargame you build a city to fit the scenario you're playing. In the future, BoardCrafter as a platform will allow you to download and print models to add to your own game, ideally enabling you to pick-and-choose what bits you'd like. No 3D printer? The developers doing a 2D version as well - and you can, of course, order finished models from the company. As befits a project whose crown jewel is 3D printing, the models themselves are wonderfully rendered and designed to look good out of a printer. The natural texture of a 3D-Printed model is barely noticeable, and in many cases looks much like a roof or house siding would look at the 15mm scale of the buildings. There are, of course, noticeable ridges on things like the figures and chits - but that's unavoidable with the tech right now, and is only a problem if that texture bothers you. For such a visually cluttered terrain setup, it's fairly easy to see what's going on. For example, road areas are made up of clear spaces or blocked spaces with wrecked vehicles - which are all very visually distinctive and easy to make out. 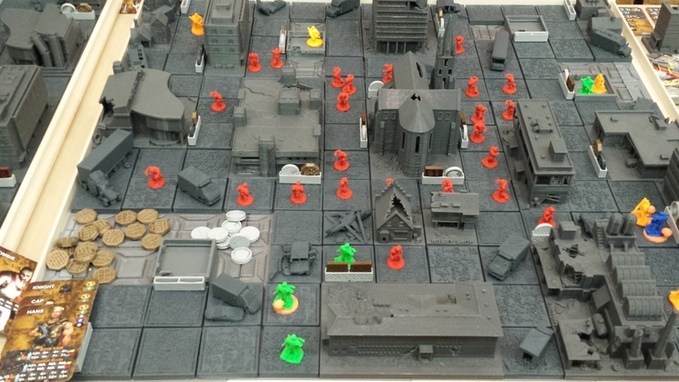 Combine that with the size and footprint of the buildings and the feel is more like a well-designed wargame with obvious silhouettes than a board game. That said, they aren't really strictly necessary. Most board gamers will be perfectly happy with the 2D tiles. NecroVirus itself plays out over a series of scenarios that build on top of each other into more and more complicated situations utilizing more and more of the game's mechanics. Experienced minis gamers will be able to leap into later scenarios after just a few shots at the early ones, but those who'd like more of a tutorial experience can get that by simply playing them in order. Regardless, most scenarios play out like this: Each player starts with a few random survivors, then traverses the zombie-filled city scavenging for supplies while trying not to get spotted. Combat is an option, and indeed, sometimes you'll have to fight, but the odds are never in your favor. Zombies will always keep spawning, and the player to your right - one of your direct opponents - is the one who gets to control them. They're actively encouraged to screw you over, to play the zombies hard, and to get the zombies' AI rules right. More than almost any other zombie game I've played, NecroVirus gets right the tension that actually makes zombies scary: It's not that you can't kill them, it's that eventually you're going to run out of bullets, food, fuel, and bandages. You break down. They don't. Most actions are a simple roll-above on a twenty sided die, and your chance to succeed or fail is right on your card for that character. Actions are also loud or quiet, which contributes to your survivor's chance of being detected - driving a tank or shooting your gun are always loud, using a meat cleaver isn't. It's an acceptable level of randomization and not too frustrating, and the numbers are pretty well balanced so that you understand what the risk and tension is going to be for any given action. That said, there's some things working against that good tension in this game, and they're beyond your control. What you can scavenge is much like a traditional eurostyle resource management game, and that's good - it's always there on the board. You can see what it is before you get there. On the other hand some basic gameplay functions are locked into decks of cards. 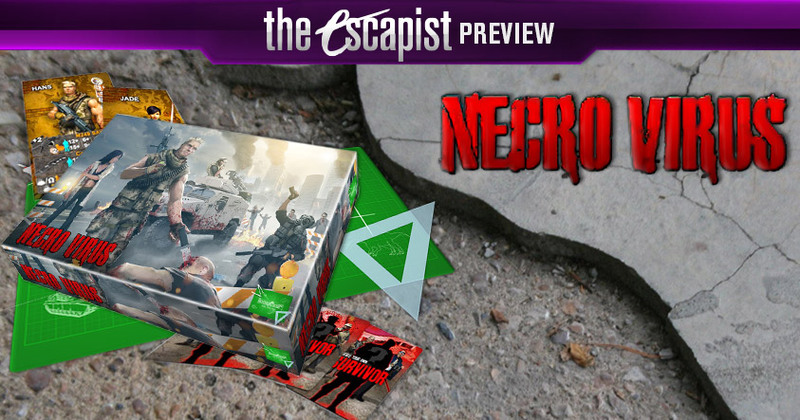 Having vital things like when new supplies show up or when you can recruit a new survivor works against players making a coherent strategy. For many players that's good in a game like this. Those random chances will generate good stories - "Remember that time I was close to the end, but you pulled that survivor with the badass flamethrower and blasted your way to victory?" Other times you'll end up with a single frustrated player who has been locked out of expanding their team and stands no chance of fighting their way to the goal. Or the player who managed to pull only wimpy nerd survivors without useful abilities versus the murder squad of flamethrowers and assault rifles another player lucked into. It's down to the cards which kind of game you get. Strangely, though survivors have different weapons and abilities, they're all identically good at sneaking around. The game is however short enough to excuse that. With a few players who'd played once it didn't take much more than an hour to do most of the scenarios, which means in a long game night or afternoon you can blaze your way through a campaign. Since the game itself is modular, expect community-made campaigns with ever-more complicated and unique special rules to make their way onto the BoardCraft site. In the end, NecroVirus feels like part proof-of-concept, part game. It's a simple little package that will surely be expanded upon and added too very easily, and those who want more of the game will certainly get it. If all goes to plan, adding more complicated mechanics, special events, and whole campaigns will be as simple as getting a few new models and cards from the BoardCraft platform. Overall, this game appeals to the wargamer in me the most: At worst, you've got a set of lovely terrain and a modular board to set it up on. At best, your lovely terrain also has a set of games that you can easily play on it whenever you like. If you're curious, go check out their Kickstarter page.